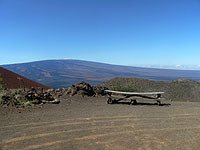 View of Mauna Loa from 9,300 ft. The road once again becomes paved. The VLBA seen from above. 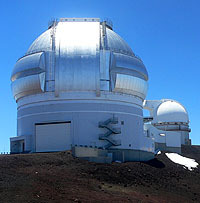 The true summit of Mauna Kea. A Note To Our Regular Readers This Scenic Drive takes you into the Astronomy section of our website. Once you are done with this page, if you wish to return to the Scenic Drives section click here, otherwise feel free to explore the other exciting pages in our Astronomy Section. 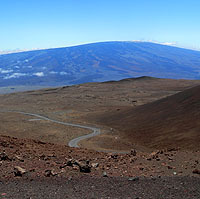 A 43 mile scenic drive takes you from sea level in Hilo (or Kona or Waimea) up to the summit of Mauna Kea at 13,796 to the astronomical observatories at the top! The drive takes you through just about every ecosystem on the island. 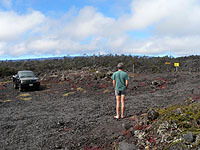 From the tropical rainforest atmosphere of Hilo on up through the 'Ohi'a forests of Saddle Road and then up the side of Mauna Kea, through ranch land and then up to the top, where little grows and the air is thin. Above 40% of the atmosphere you will have a stunning, 360° view. On a clear day you can see Maui and the neighboring islands as well as the active Pu'u O'o vent in Volcano! 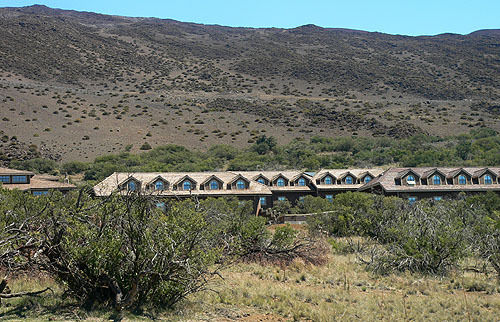 This is a perfect day-trip as well as combining it with tours of the fascinating observatories at the top and a view of the sunset as it dips into the ocean. This drive takes you from sea level to 13,796 feet in a very short period of time. The high altitude affects people in different ways. Please heed the following warnings! Breathing - Do not take this drive if you have respiratory problems. 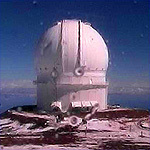 The summit, at 13,796 feet has about 40% less oxygen than at sea level, thus breathing is more difficult. Heart - Do not take this drive if you have any type of heart condition. High altitude causes your heart's arterial vessels to dilate. Your pulse rate will increase and movement will be more laborous at the summit. Wear UV Protection - Always wear UV Sunglasses at the summit and if you are not a regular at the summit of Mauna Kea wear a high number UV sunscreen. 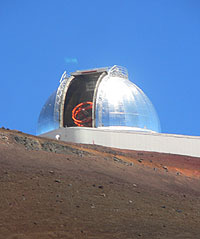 It is possible, on clear days, to burn within 15 to 20 minutes of exposure. Watch Your Food - Try to avoid eating foods that cause gas or bloating at least 24 hours before you plan to go to the summit. The decreased pressure at the summit can cause increased discomfort. You will, however want to bring snacks with you to the summit as many people get unusually hungry (especially for sweets) when at the top. Avoid Dehydration - The summit is extremely dry. Avoid dehydration by bringing and drinking plenty of water. Drinking water can also help quicken your adaptation to the summit. Do not drink alcohol! Acclimate 20 to 30 Minutes - At the 9,200 ft level is the Visitors Center. Stop at this point for 20 to 30 minutes to help acclimate to the altitude. We have incorporated this stop, along with another short hike into this Scenic Drive to help you acclimate. Do Not Scuba Dive - Do not attempt to drive to the summit if you have been scuba diving to 50 ft depth within the last 24 hours or 100 ft depth within the last 48 hours or you risk the bends (decompression sickness). Wear Warm Clothes - It is both cold and windy at the summit. Wear warm clothes, jacket and you may want to consider gloves and a hat. Note: a clean pair of socks worn on your hands can be used as mittens. As if the above list were not enough... the largest problem at the summit is altitude sickness which symptoms range from irrationality to nausea and even fainting. It is common for couples to fight at the summit only to totally forget why once they get back down. To help avoid altitude sickness move slowly while at the summit. Avoid talking and moving at the same time. Take slow, deep breaths. We do not list this drive as a 4-wheel drive. There are a couple of reasons for this. First, most of the drive is not 4-wheel. This scenic drive is fine up to the visitors' center at the 9,200 foot level. Past that level the road is dirt for a few miles and 4-wheel drive is recommended - however, we certainly see plenty of non-4-wheel drive vehicles at the summit. The basic problem is that the summit is steep and it is hard on a vehicle to go up, and especially hard on the brakes coming down. Do not rely on your brakes to descend the mountain - you will burn or crack the brakes. Use the engine by downshifting to do most of your speed control! 4-Wheel vehicles should use 4-wheel low to descend the mountain. Many of the rental companies make you sign paperwork that say you won't take the car on Saddle Road. The reasons for this range from the road being narrow and curvy in parts to no services along the road. The rental car company doesn't want to have to come out to give you gas. However, we see plenty of rental cars on Saddle Road all the time and the rental companies do not actually monitor where the cars go. However, if you would feel better about it, Harpers Rental, at (808) 969-1478, not only allows their vehicles to go on Saddle Road, they also rent a large assortment of 4-wheel drive vehicles. There are times when the summit is closed to the public. This can occur during extreme weather or, more likely, in the wintertime due to snow. The summit employees road maintenance crews who also do snow removal but conditions can sometime cause cleanup to take several days. 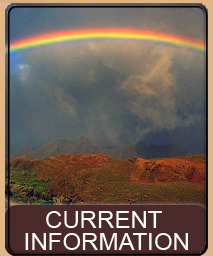 It is highly recommended, especially in the winter, to call for a Road Condition and Closure report by phoning (808) 935-6268. This Scenic Drive takes you to the summit from Hilo, which we consider to be the more scenic of the two possible directions (the other being from Kona or Waimea). 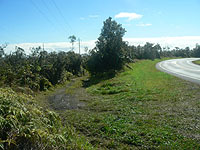 The Hilo side of Saddle Road is, in spots, very curvy. When going up be sure to watch out for out-of-control vehicles that are coming down. When descending heed ALL speed limits. You will notice that on every extreme curve there will be a fresh set of skid marks, tire tracks in the grass and a bashed tree. Don't be one of those! 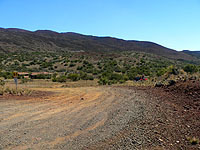 At the point where Saddle Road junctions with the road to the summit you are entering open-range ranch land. Often you will pass through mist and clouds that obscure the road. Be aware that cows can sometimes wander onto the road or sit in the road. An invisible cow is something you don't want to hit! 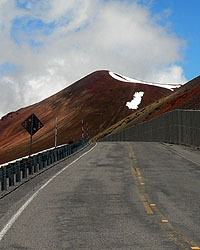 There are two (sane) ways to get to the summit of Mauna Kea and both involve getting onto Saddle Road, from one end or the other. Saddle Road is the road that goes between the East side of the island to the West side of the island, right through the middle between Mauna Kea and Mauna Loa. It is a wonderful drive in either direction but we are going to take you from Hilo on up because we feel that is slightly more interesting. If you are coming from Kona or Waimea, you can easily find Saddle Road on the map. Simply take it to the summit junction that we describe in this drive. At the junction, as we instruct later, reset your odometer and the rest of the drive up will then work with our mile markers. There have recently been changes to how you can get to Saddle Road from Hilo side. 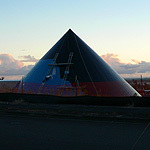 The most striking is the Puainako Extension, which allows you to go from Highway 11, near the KTA food market, up Puainako. At Komohana intersection Puainako now jogs onto a brand new extension that becomes Saddle Road. We actually, however, prefer the older route - which is what we will describe here. We start this drive in the heart of downtown Hilo Bay Front. To get there take Kamehameha Avenue to its end in downtown Hilo. 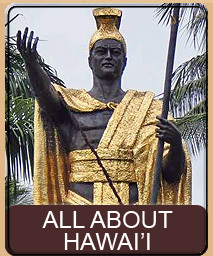 The final light is the junction of Kamehameha and Waiānuenue. If you go right you are heading up the Hamakua Coast, and if you go left you are heading up towards Saddle Road. Note that before you get to this point you should have completely filled up your gas tank. There are no services once you get on Saddle Road. As you head up Waiānuenue you go through downtown Hilo. The second traffic light, after you turn, is the downtown Post Office. Just further down the road are a number of small restaurants. If you don't have snacks, water or food you must stop and get something. If you prefer, turn left at the Post Office traffic light (onto Kino'ole) and just down the road you will find a Sack and Save supermarket (if you choose this stop be sure to return to Waiānuenue when you are done). As you head up Saddle Road at around the 8 mile marker you leave the area of Kaūmana and the houses will begin to thin. At this point Saddle Road begins to get very twisty. Be very careful here as cars coming down hill often go too fast and can easily lose control. We highly recommend you have your headlights on! As you head through the twists and turns you are going through a pristine, native 'Ohi'a Lehua forest. These beautiful trees with their bright red wispy flowers are unique to Hawai'i and are the official flower of the Big Island. You will see many pullouts and side roads as you twist and wind up the hill. Many of these are simply loops that come back to the road and most are used as access points for local hunters. If you get some speed freak behind you, feel free to pull off in one of these areas and let them pass - it's the local way! As you go up the hill you might pass through rain. Do not worry too much about the weather on the way up. As long as you have checked the weather for the summit, it is not uncommon to pass through a number of rainstorms as well as cloud layers as we climb both Saddle Road and the road to the summit. 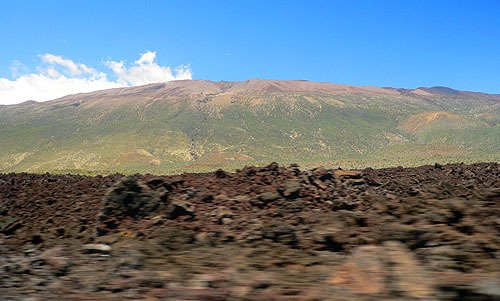 As the name implies, Saddle Road is the Saddle between Mauna Loa, the world's most massive mountain that will be on your left, and Mauna Kea, one of the worlds tallest mountains (measured from it's base) on your right. If you have the good fortune of being on this hill during a crystal clear day you will receive many stunning photographic views of both mountains all along this drive. At the 14.5 mile marker, on the right side of the road is an easy-to-miss side road. The road angles away from you back towards the Hilo direction. You will probably see it in the rear view mirror as it is on a left hand curve and slightly hidden. This dirt side road is for another time, but is an interesting diversion. If you take the dirt road, after a little bit it T's. Taking the left at the 'T' and heading about a mile you will come to a very small stream. Most people either park back near the 'T' or at this point as even though the stream is easy to step over, only the largest of 4-wheel will be able to get across (we did, and on occasion we were balancing on our front right, and left rear tires, the other two being totally off the ground *shudder*). Anyway, step over the stream and continue another mile. At the end the road simply stops. You will see a small trail leading forward, at the very end of the road. Take the trail a short distance (about 20 feet) to the Wailuku River where you find an abundance of beautiful swimming holes and spots. Do be warned though to not swim if you have any cuts or scratches as Hawai'i rivers all have Leptospirosis and Giardia. Anyway, this is a side trip for another time and another Hikes and Trails description. At the 16.1 mile marker, on the left side of the road, is another side road called Tree Planting Road. This is a popular spot for hunters and is also a nice stroll. The road is straight and goes on for miles and miles and makes for a nice stroll, but again, we have too much to do so save this for another day. As you pass the 19 mile marker the 'Ohi'a trees begin to thin out and give way to a'a lava flows of 1855. Around the 21.2 mile marker is an extremely dangerous curve, a spot where many people have died. The Kipuka (an area of land that was undisturbed by a lava flow around it) on the right, below the curve, is an excellent are for birding. There is a very small pull-off here and a little trail that descends into the Kipuka. Keep driving. At the 22.4 mile marker, in the middle of the curve and on the left side of the road is a small pullout with trail markers. This is Pu'u O'o Trail and is an excellent hike. Again, not for today but we will give you a brief description here (and you can expect to see this written up as an official hike as soon as we can get to it). Parking in the pullout, follow the trail into the tree line where the trail 'T's and heads either left or right. Taking the right trail simply follow it. The trail goes for miles (we have done about 4 miles of the trail) and transcends from mainly Koa and 'Ohi'a forests into open meadows. 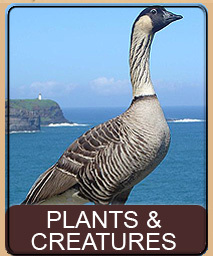 It is a very pleasant and easy walk and excellent for both birding and the occasional glimpse of wild pigs and goats! It is a one-way trail, meaning that you come back the same way you went in. Keep driving. At the 23.0 mile marker you enter the District of North Hilo. And just past, at 23.1 is the Pu'ualo Ranch on the right side of the road. At the 27.6 mile marker is a red dirt road on your left - at this point you are going to have our first break and a hike... and your first decision. Read on to see how you are going to hike to the top of Pu'u Huluhulu. About time, you are probably thinking... after all those descriptions of nifty places to stop, and we had you whiz past each one of them, we are finally going to get out of the car and stretch. There are two reasons we are going to take a hike here. First, you just drove up 6,000 feet in a pretty short period of time. The air is already getting thinner and you need a stop to help get used to the difference. A short hike here will greatly help you handle the summit. The second reason is that your vehicle is also experiencing the same drop in oxygen. Loosen your gas cap to let some of the vapors escape (you should hear a hiss), this will help keep your gas from gushing out as you quickly ascend Mauna Kea. Oh yeah, there's a third reason to do this hike, it is an extremely beautiful spot, but you can already see that. Pu'u Huluhulu is the large forest covered cinder cone on the left side of the road (or the right side of the road if your coming from Kona) at the 28 mile marker. 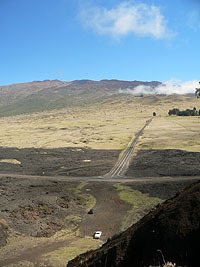 Interestingly enough the 28 mile marker is also the junction with Mauna Kea Access Road, which is the road we will be taking to the summit, so no matter which way you came on saddle road, this is where we are going to both meet. 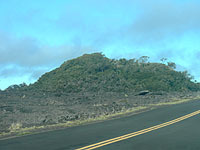 Do not confuse this Pu'u Huluhulu with a similar cinder cone in Hawai'i Volcanoes National Park. Both are named Pu'u Huluhulu which means hairy hill, it is not uncommon to find many places with the same name around the Big Island. Here is where the decision we mentioned comes into play. There are three ways to the top of Pu'u Huluhulu. One of them we don't recommend, that leaves two. Of the two, one is a more rugged quick ascent that takes you through a variety of interesting places, while the other is a gentler stroll up an access road. Turn on the red lava road and drive about 50 feet to the gate in the fence that surrounds Pu'u Huluhulu. Get out of your car and go through the gate making sure the gate is closed behind you. This hill is protected from pigs due to the native plants and birds that live in this Kipuka. Right in front of you is the start of a rugged trail that goes up the side of Pu'u Huluhulu. This trail begins steep and rugged but soon tapers out with a nice stroll through underbrush before again becoming steep. If you prefer the more tranquil trail, go past the red lava road and pull into the road at the 28 mile marker that is in front of Pu'u Huluhulu. There is a little shack and a bathroom here, as well as a place to park. This is a hunter's station and again there is a gate in the fence. Go through the gate. We have this hike completely reviewed in the Hikes section of this site. 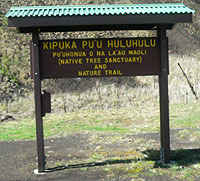 To read the entire description of Pu'u Huluhulu please read The Pu'u Huluhulu Hike on Saddle Road. Ok, back into the car after that fun and exhilarating hike. Returning to the 28 mile marker you are at the junction of Mauna Kea Access Road and Saddle Road. Reset your odometer here so that no matter which way you came up Saddle Road, the rest of this makes sense. Head up Mauna Kea Access Road - we're going to the summit! This is one very quick drive to the top, with breathtaking views. Do not be concerned if you go through fog, rain or cloud layers here, this part of the island is right in the middle of the wet to dry transition and it is not unusual to see all sorts of weather here. Do, however, be careful about invisible cows as this is open-range land and cows often stand or sleep in the road. If it is foggy drive extra cautiously. Immediately, on the right at the .8 mile marker is the Humu'ula Ranch. At the 2.1 mile marker, on the right side, is a dirt road. Remember at the top where we said there were two (sane) ways to get to the summit, well this dirt road at 2.1 is one of the insane ways. This road is commonly called Mauna Road, but this part of the road is actually named Keana Kolu Road, and where it comes out at the end is called Mauna Road. This road comes out in Waimea (no kidding, it winds around Mauna Kea and comes out up in Waimea) and it is a fantastic 4-wheel drive. The road takes you through pastures, cow land, past the Sir Douglas Monument, past a protected native plant and bird preserve, over the Wailuku river and around to Waimea. This is a drive we will save, and write up, on a later date. 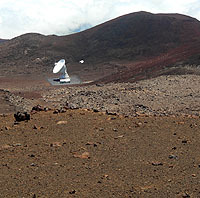 Back to our goal of the summit of Mauna Kea, at the 2.5 mile marker, on the left is a gated and rugged road to the little cinder cone that is bristling with antennas. 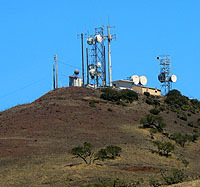 This antenna farm is mostly a telephone relay station beaming it's signal to a similar microwave array on Mauna Loa. 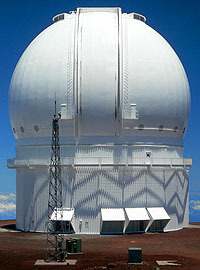 At 4.3 you go over an iron grate and you will see signs with a variety of warnings and information about the summit of Mauna Kea. At this point the drive gets a little more curvy and you begin to get good views of the beautiful and distant cones, including some very striking brilliant red cinder cones. As we approach the 6.4 mile marker you will begin to see signs of life with a number of buildings appearing on your right. Just before this point, at the 6.1 mile maker is another dirt road going off to your right. This is the second insane road around Mauna Kea. 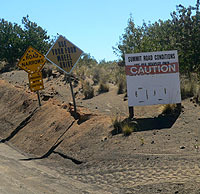 This road is Kahinahina Road and goes around Mauna Kea at the 9,200 foot level until it comes out near the Girl Scout Camp down further on Saddle Road (towards Kona). 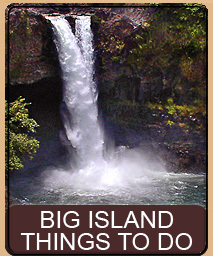 This 4-wheel drive is an utterly fantastic drive and shows you a part of the Big Island few people get to see. Again, look forward for the write-up of this fantastic drive to appear here later this year. 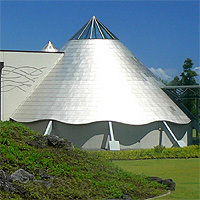 At the 6.4 mile marker is the Onizuka Center For International Astronomy Visitor Information Station. Pull into the parking lot as this is going to be our second stop of the day. You are now at the 9,200 foot level and the ascent from here to the top is very fast. We need to get out of the car here and spend a minimum of 20 minutes at this altitude. 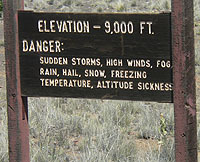 This will help you better handle the conditions at the summit as well as reduce the chance of altitude sickness. You also need to check here as to the conditions at the summit, to make sure it is safe to proceed. We need to point out here that from this point, to the summit, 4-wheel drive is recommended. This is not to say that we don't see convertibles, and just about every other rental car at the summit, we do... but 4-wheel drive is recommended. And if it is winter, don't even think about doing it without 4-wheel if there is snow on the summit. 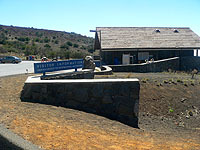 The visitors' center is an excellent place to learn more about the summit observatories. Representing the 12 countries with a presence at the summit (US, Hawai'i, Argentina, Australia, Brazil, Canada, Chile, France, Japan, Netherlands, Taiwan, and the UK). The center is named after Ellison S. Onizuka, born in Kealakekua on the Big Island, who died as a NASA Astronaut in the Challenger Shuttle explosion on January 28, 1986. The visitors' center bookstore is open from 9:00 AM to 9:30 PM, daily, throughout the year. However, there are bathrooms accessible on the outside that are open even if the center itself is closed. 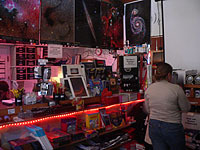 The center offers a short film about the summit, displays and computers loaded with information and presentations about the various observatories, and a gift shop loaded with interesting astronomy related items. There is also free coffee and tea. On sunny days the center has sun-gazing devices that let you view sunspots and track the suns movement. 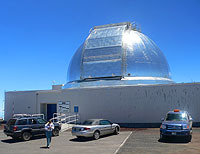 Every evening of the year, from 6:00 to 10:00 PM, the center offers free stargazing where many local enthusiasts bring their telescopes, and the center brings out its large scopes and everyone gets to look at the stars. 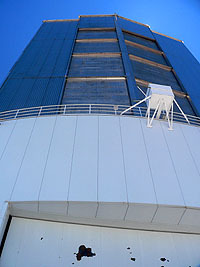 You can also book tours of the summit through the center, which are held on Saturday and Sundays from 1:00 to 5:00 PM. 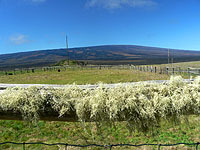 You will find picnic tables behind the parking lot as well as a fenced area where there are silversword growing. However, if you have a 4-wheel drive we also recommend a nearby picnic table. A tenth of a mile past the visitors' center, just before the dirt road to the summit, at the 6.5 mile marker, is a dirt road that goes to the left. 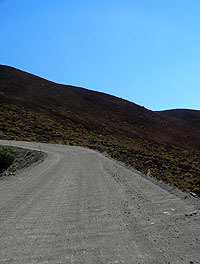 This road is the start of Humuula Trail to the summit. Put your vehicle in 4-wheel and take this road. After a short distance it will branch, take the right most road and you will come up and around and be in a small cinder cone with a picnic table and a stunning view. Enjoy your food and come back down. While you were at the Visitors Center you undoubtedly noticed the large number of buildings just above you. This is Hale Pōhaku, which is Hawaiian for Stone House. 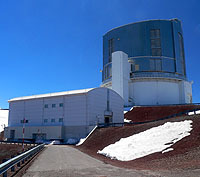 This is where the summit day and night crews, astronomers and other summit workers live while they are working at the summit. By allowing them to live at the 9,200 foot level they acclimate much faster at the summit. The day and night crew and other local workers are rotated on 4 to 5 day swing schedules and then given time off to allow them to catch up on sleep and have somewhat of a normal life. The facility has room for more than 72 people and includes a cafeteria, private rooms, pool and other entertainment, computer facilities, laundry facilities, a complete library, TV, cable, and video games. 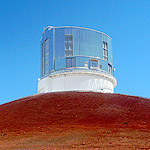 Hale Pōhaku is not open to the pubic and only summit vehicles, summit workers, and visiting guests are allowed on the grounds. 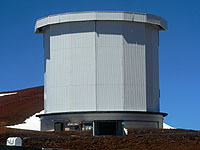 Hale Pōhaku is home to the workers and astronomers while at the summit. Ok, now, with no skimping on time and guaranteeing to us that you spent at least 20 minutes at the visitors' center, we are now ready for the last part of the summit trip. 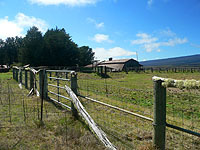 Leaving the visitors center, continue up the hill past Hale Pōhaku to the entrance to the dirt road. At this point will be a summit conditions sign either refusing you entry (usually due to bad snow weather in the winter) or allowing you through. The sign also says 4-wheel only but you already know what we have said about that. If you choose to do this road in a regular car, do NOT burn your brakes out on the way down! And whatever you do, do NOT do this in a regular car if there is snow at the summit. 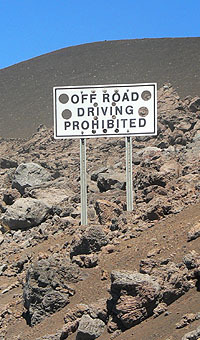 One reason that this road is dirt is that originally the astronomy community wanted to discourage a tremendous amount of pubic attention to the summit as such activity brought dust and (at night) unwanted lights. But that attitude has since changed to one of endorsing public visits as a way to help educate people as to the wonderful discoveries being made at the summit. 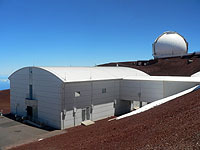 In fact, several of the observatories, such as Subaru Telescope now offer full tours of their observatory. The dirt road used to be poorly maintained and it was often easy to go skittering - however recently they have begun almost daily maintenance and it is now a much smoother drive. Be careful though, there are no guardrails and drop-offs are extremely steep and there are many blind hairpin turns. The drive is fantastic and the views are utterly breathtaking but don't be so caught up in the scenery that you forget the road. The cinder on this part of the mountain is natural ejection from the various vents that dot the landscape. 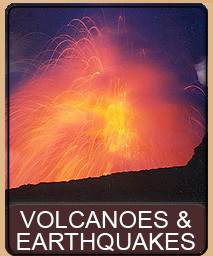 In places you will see lava bombs, round or football shaped rocks that are the result of molten lava being ejected high into the air and cooling as it tumbles to earth forming those perfect shapes. 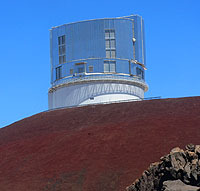 Colors range from vivid reds of iron rich deposits to grays and browns with many vents and cones. 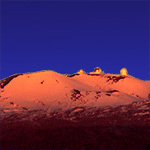 Mauna Kea was, and can be again, a very active volcano! After a few miles the road will again revert back to paved (thank goodness) and you continue up towards the summit. At the 12.0 mile marker you will see, on your right, a lower depression and flat area. This is where NASA tested the Lunar Lander as they theorized that the soil and conditions here were similar to what they might find on the Moon. There is little left behind to indicate their presence, as everything had to be environmentally restored after they were finished. At the 12.4 mile marker is a road to the right. 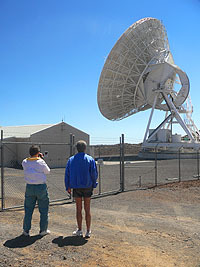 This takes you out to a Radio Telescope, a HUGE dish that is 82 feet in diameter and weighs 240 tons, is a part of the worldwide Very Long Baseline Array (VLBA) run by the National Radio Astronomy Observatory. This impressive dish is almost always being used, and if you wait long enough you will get to see and hear it move slightly as it tracks celestial objects. This particular installation can operate 24-hours a day, unmanned. A bit past the Radio Telescope, on your left will be a trail snaking between two hills, and an old blocked-off parking area. Just past this, on your right will be another, accessible parking area. The trail you see goes to Lake Waiau, the only glacially formed lake in the mid-Pacific ocean and the 3rd highest lake in the United States. 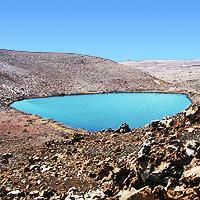 If you are interested in taking this trail read our complete review in Mauna Kea - The Hike To Lake Waiau. Continuing past the trail to the lake, you wind around a curve and are suddenly at a junction in the road. We recommend making a left hand turn here. The road here now becomes a loop, which takes you past the various domes. You will go past a couple domes and then see the array of small dishes that are part of the Smithsonian Submillimeter Array. The road here becomes dirt and ascends with a 5 mile per hour sign. Please observe the 5 mile per hour sign as anything over that produces dust. Be careful for oncoming observatory vehicles. The Smithsonian Submillimeter Array sit on concrete pads and are moveable. 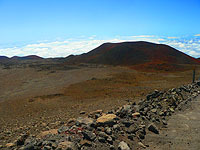 As you go up this section you are winding around the backside of the summit of Mauna Kea. 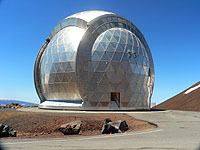 You should have a fantastic view of Waimea and on a clear day the Island of Maui and other islands to the left of Maui. 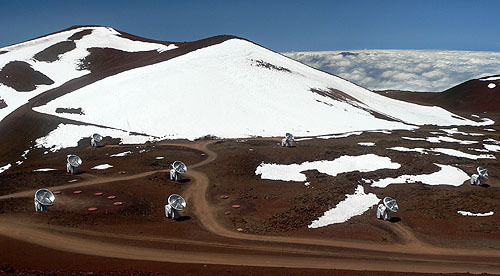 The cinder cone you see behind the Submillimeter Array was the original home to the first telescope on the summit, which is no longer there. 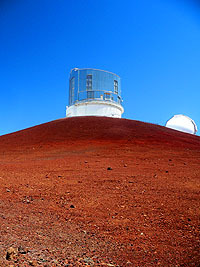 Once you reach the top of this dirt section you will be at the Subaru Telescope Facility, one of the world's largest single-mirror optical telescopes. 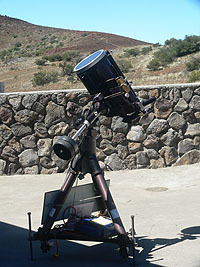 This telescope is available for public tours (which require you to make prior arrangements). 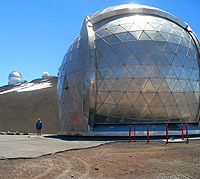 You can also read our very complete virtual tour of the Subaru Telescope by going to our Anatomy Of A Telescope - Subaru Telescope Project on Mauna Kea section! 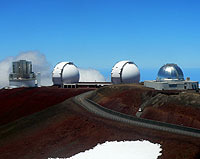 Subaru Telescope is on the left with Keck Observatories twin domes on the right. Continuing past Subaru you will wind back at pavement which will take you to a number of other observatories and then wind you past the true summit (which you can hike to, if you are so inclined) and then down a hairpin turn with a remarkable view and back to the 'T' in the road. To get home simply descend the mountain BEING SURE NOT TO BURN OUT YOUR BRAKES and then, once you hit Saddle Road, turn right to head for Kona or Waimea or left to go back to Hilo. Be sure to drive carefully because you may still be mentally confused from the summit and the road is very steep and very curvy and very fast. Don't end up a road statistic! 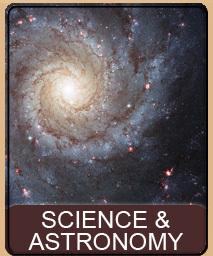 This page is named 'Astronomy.drive'. Can't Find It?